Aston is a shell replacement application, which gives you possibility to get a completely new, powerful and easily configurable desktop, making your computing a more pleasant and productive experience. Aston completely replaces your old desktop with a new one, providing numerous additional features and saving your computer's resources for more necessary tasks. By installing Aston you get a lot more than just a fancy look, you get a more efficient way of using your computer. Toolbars (side panels on the left and right sides of the screen) give you easy access to the most needed documents, applications and web links. Multistate Taskbar buttons let you know exactly if a certain window is active or minimized, they also adapt to the width of the Taskbar and are thus easier to manage: no precious screen space is wasted. Aston Quick launch can be as small as a single button: easy access to your shortcuts without turning the Taskbar into a garbage dump. You can hide and restore System Tray icons with a single click or keystroke. This feature even works under Windows 98/Me/2K. Keep your Desktop clean: use the Panel plug-in to organize your files without turning the desktop into a dumping ground. Desktop icons can have any size, any form (thanks to alpha-blending) and can be animated as well. Get rid of regular limitations. A built-in Hotkey Manager makes your work with Aston even more pleasant and effective. Much more... just install Aston and find it yourself. We've spent a lot of time polishing Aston in order to make sure it runs as fast as possible. No matter if you have a five year old PC or a powerful high-end system, Aston is always the right choice. 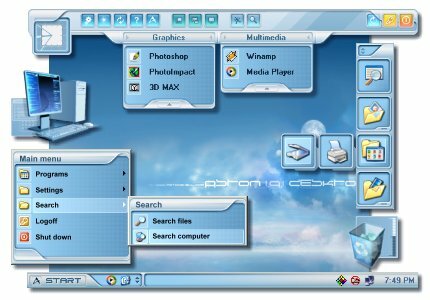 Aston, running with its most feature packed eye candy Themes usually consumes about half the RAM that the Windows XP desktop needs and gives you much more in return. Aston is known to be one of the most stable Windows shells ever. It's even far more solid than the Windows 98/Me shell. Do you need an additional clock on your desktop? Or maybe a weather forecast? No problems! Just activate additional Aston plugins and enjoy. Plugin files are small to download and only require seconds to install. You can tweak any parameter of your Aston desktop using a simple GUI interface: no need to read complicated manuals every time. Ordinary Windows Themes make only few changes to the look of your system. Windows XP Visual Styles just decorate it a little. With Aston you'll get a fast, beautiful, reliable and easily controlled desktop and would never wish to switch back. Interesting facts: We use Aston on our own computers: we don't create software we wouldn't liked to use ourselves. Most desktop enhancement software tools slow down your system, consuming additional memory and processor resources. Unlike these tools, Aston completely replaces your old desktop and releases your computer's resources for other tasks. Aston runs nicely on systems that labor with the normal Windows XP desktop. Tested extensively on numerous computers Aston is known to be the most stable program of this kind. It's much more stable than competing programs and even the native Windows 98 and Me desktop. Whether you have Windows XP or Windows 98, Aston runs smoothly on any system, providing you with additional toolbars, launch panels and other useful components, allowing you to get more control on your system. Aston looks great out of the box and if you want more, you can get free Themes from our Themes section or one of numerous related sites. You can change the look and feel of your Desktop with few mouse clicks. Create your own desktop and make it look and behave the way you like. That's the main idea behind Aston. Bind hotkeys, tweak desktop components, instal plugins, never lose control over your desktop. No wizardry here, everything is simple. Even if you're not an experienced designer or programmer, you can create your own desktop the way you want it, not like someone else does.